The first Dynamiq GTT 115 Hybrid has successfully completed sea trials. Construction on the 35 metre full aluminium yacht was completed early this year and last year was listed for sale for €13,950,000 with Edmiston & Company with Northrop & Johnson. 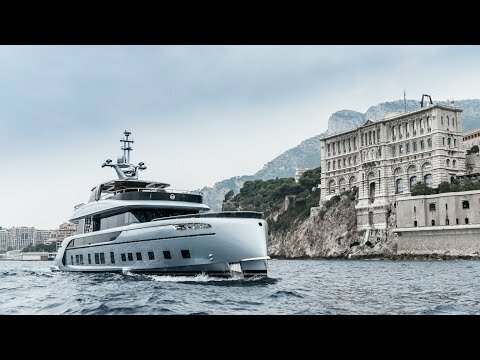 The Italian yard described the performance results for the Studio F.A Porsche-designed 35 metre full aluminium yacht as “remarkable”. The yacht, which is the first hybrid in the GTT series, hit a top speed of 22 knots, one knot more than originally estimated. 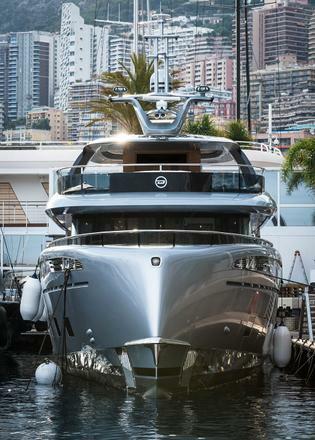 Fuel consumption was measured at 240 litres an hour at a cruising speed of 17.9 knots. The yard also put the model’s hybrid mode to the test. With the main engines turned off, the yacht was powered by two 20kW electric motors operated by variable speed generators. The GTT 115 proved that it can cruise at 5.5 knots in complete silence for extended periods. 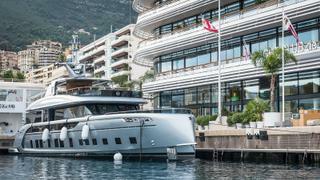 The yard said the yacht’s fast displacement hull “made all the difference”. Styled inside and out by Studio F.A. Porsche, this all-aluminium yacht features an exclusive stabilisation system and a round-bilge hull, finished in Rhodium silver metallic paint. Roland Heiler, CEO of Studio F.A. Porsche, said: "Taking the spirit of high-performance sportscar styling to the high seas, the Dynamiq GTT 115 is designed to appeal to car lovers and forward-thinking yacht owners who appreciate the advantages of speed, style and our philosophy of intelligent performance." Key features include a vertical prow and a superyacht spa pool on the upper deck, which is situated just forward of the shaded al fresco dining area. Guest accommodation is all below decks with a choice of three or four cabins available. Porsche design influences include the Pepita houndstooth deck cushions, similar to those found on classic Porsche 911 sportscars from the 1970s. Furniture and decoration was developed in collaboration with Minotti, whose influence can be seen in the Saddle brown and Luxor beige leather, carbonfibre detailing, Macassar ebony and Sahara Noir marble. Built to RINA classification and MCA compliant, the Dynamiq GTT 115’s naval architecture was provided by Dutch studio Vripack. Power comes from a pair of 1,650hp MAN V12 diesel engines twinned to Fortjes pod-drives and three variable-speed generators for a top speed of 21 knots and a maximum cruising range of 3,400 nautical miles. The GTT 115 is the second superyacht to be built by Dynamiq — the yard made its Monaco Yacht Show debut in 2016 exhibiting the 39 metre Spring, which aims to rewrite the rules of yacht buying via a configurable approach to specification.